Rajrang presents wide range of Indian designer Indian ethnic product. this product are work of India's experienced craftsmen. A team of skilled craftsmen from different parts of India work tirelessly to carve out a variety of Indian handmade cushion cover. It can be used for decor and give an ethnic look to your living and bedroom area. You can easily fetch many compliments from your guests and relatives. It must be more useful choice for change the interior. 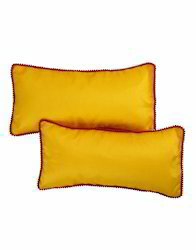 An elegant replacement Bed Pillows for your old accent pillows. Made up of polyster material, the Pillowcase are easy to wash and maintain. Create luxury and comfortable seating with these laced lumbar pillow covers, crafted beautifully.It comes with zipper closure. These are amazing to use them on the couch,bed, sofa or window seat. An elegant replacement sofa Lumbar Pillow covers for you old accent pillows covers. Made up of poly dupion material, the covers are easy to wash and maintain. 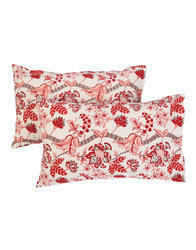 Create luxury and comfortable seating with these back pillow covers, crafted beautifully.It comes with zipper closure. These are amazing to use them on the couch, bed, sofa or window seat.